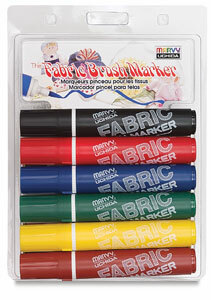 The Marvy Fabric Brush Marker is the easiest way yet to paint fabric. It's like the Marvy Fabic Marker, except that the Brush Marker has a special, flexible nib that works just like a paintbrush and writes instantly on clothes. Sets include six colors. Black, Red, Blue, Green, Brown, and Yellow.